We offer Signages for Industrial Safety to be installed at construction site, high voltage area, electrical and power transmission areas, hospitals, and allied places. These are an easy way to reaching out to the onlookers and prohibiting the entry of trespassers. Known for durability and high end visual appeal, these signs used for industrial safety application across the diverse sectors hold great significance in terms of customization and quality. 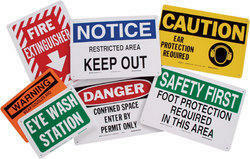 We offer Safety Sign that is especially used for industrial safety purpose. Available generally in reflective radium stickers/ Retro Radium Stickers/ norma stickers, these are widely used in outdoor applications. 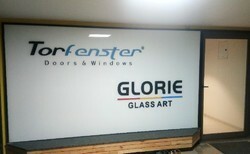 These stickers are pasted on different Materials like GI, Aluminum sheets, Acrylic, PVC, etc as per the client's specific demand.